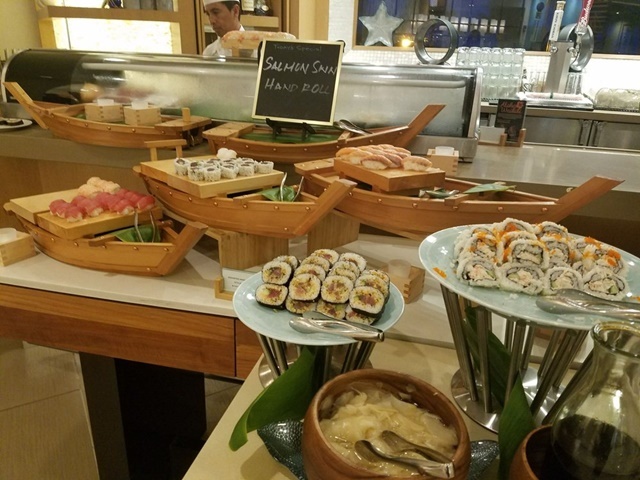 We started Day 2 at the excellent Hyatt breakfast buffet. Lots of fruits, pastries plus the obligatory bacon and eggs. Mary Ann and I did our traditional “make our lunch at breakfast” routine. I usually made a sliced meat and cheese sandwich. Mary Ann usually grabbed a yogurt and we both took some fruit. We would slip the stuff into Zip-Lock Bags and carry them in our back pack. This is a Red Rump Crested Bulbul. 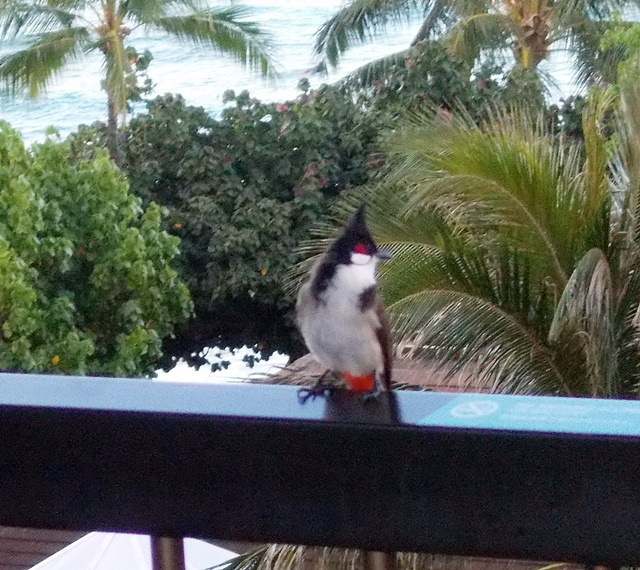 He visited our balcony and had bread crumbs for breakfast. 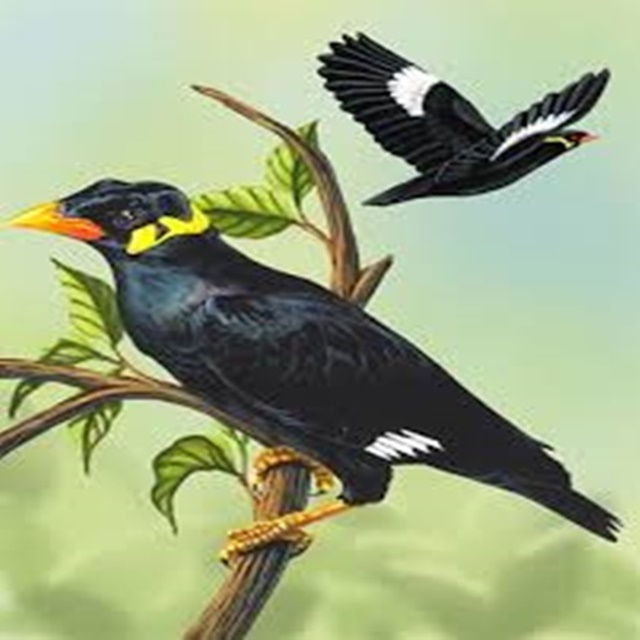 This is an internet picture of one of the most common birds on the islands: The Hawaiian Mynah. They were everywhere. As common as Robins on the States. They also visited our balcony, but I never was able to photograph one up close. Before meeting our group, I went down to the street to investigate some strange noises. 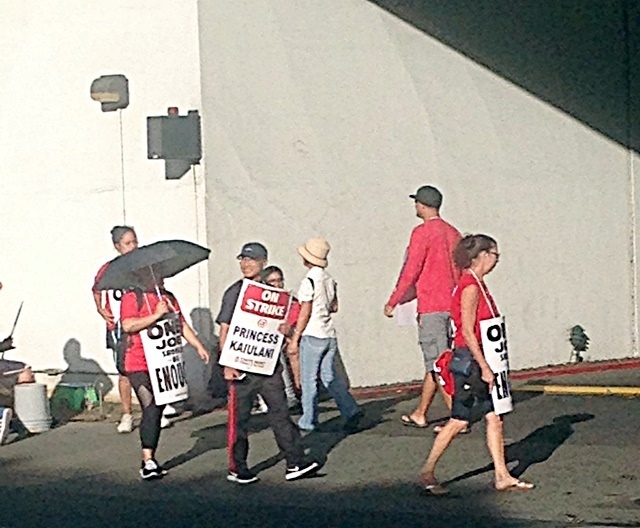 There were two Sheraton properties nearby that were being picketed. They were Sheraton employees who were demanding better pay. They were beating on drums and chanting “One Job Should be Enough!”. This is Carol Mardinly. She was our “Mother Hen” on the tour. Her title was Tour Manager. She was excellent! She kept us informed of everything we were to do and when to do it. 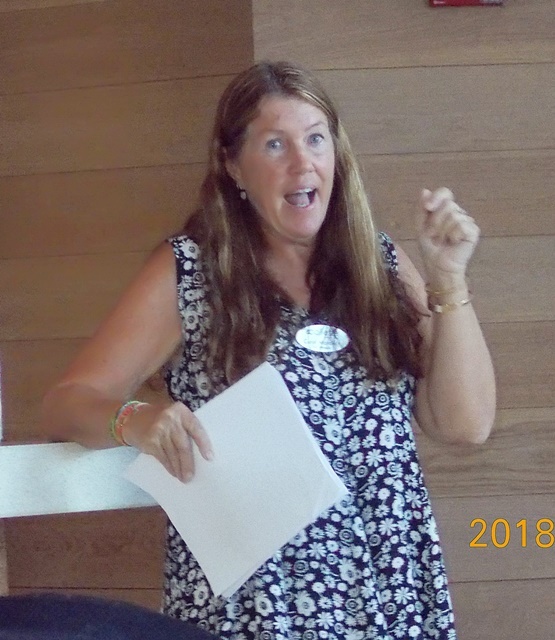 She knew her way around the islands and coordinated our buses, admissions, group dinners, and was always available to answer questions and make suggestions. 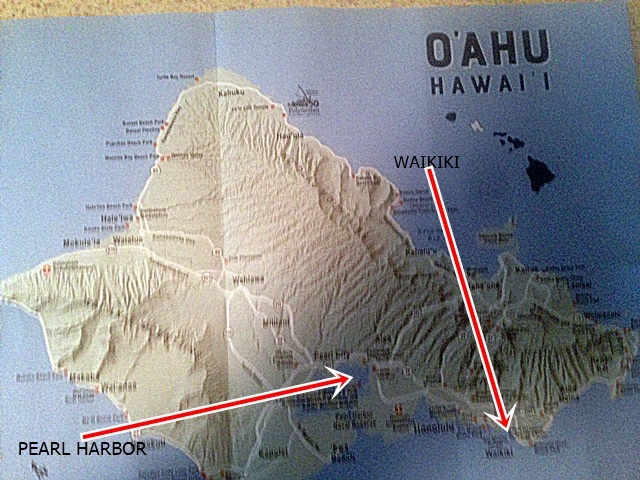 Here is a map of O’ahu showing where we stayed on Waikiki Beach and the location of our first stop on our tour: Pearl Harbor. It was about an hours bus drive through Honolulu. Incidentally, Honolulu is a big city with lots of skyscrapers, traffic, and people. Not the type of place for a leisurely wander through parks, museums, and other “tourist” attractions. 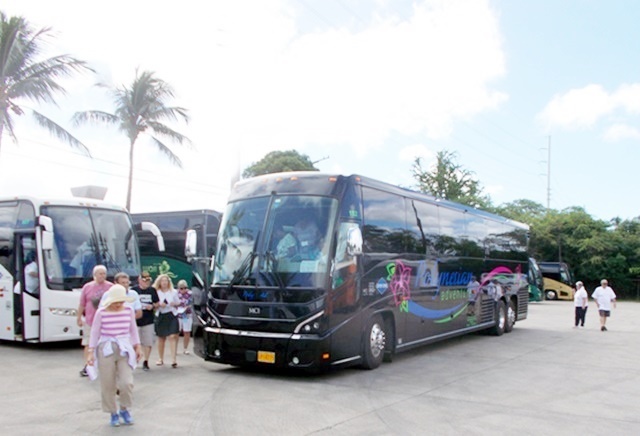 Here is the bus we used on O’ahu. Clean, comfortable and well driven by our City Tour Lady: Leihulu. 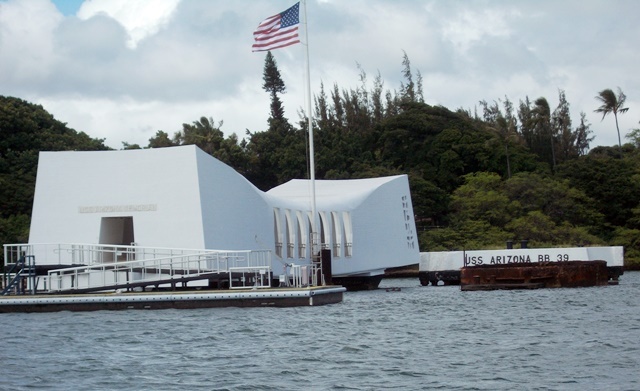 This is the entrance to Pearl Harbor. 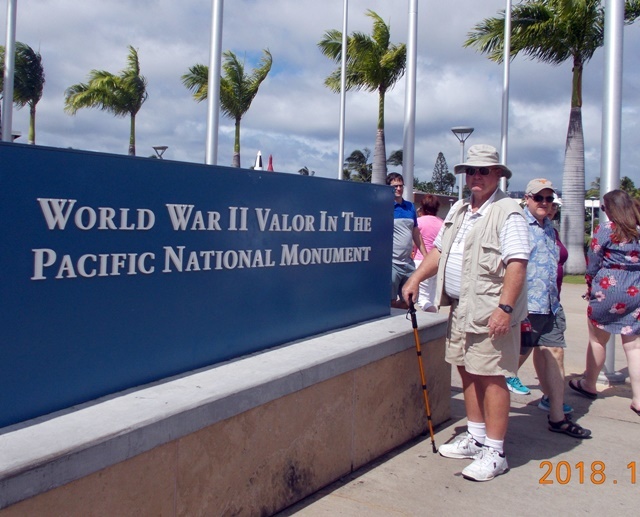 Notice my walking stick, hat, and travel vest. I used them a lot on this tour. 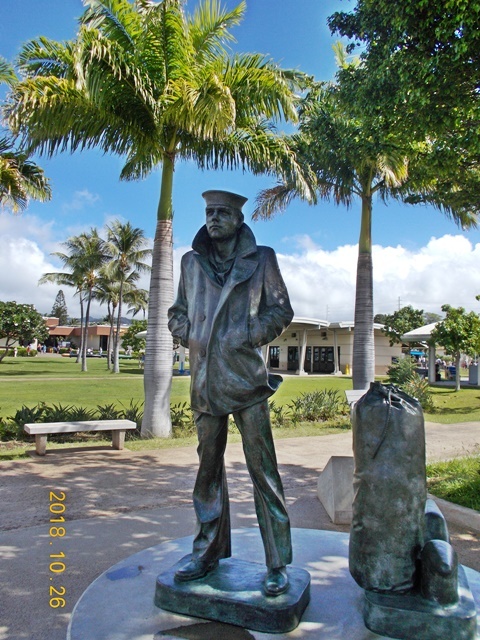 The first thing I saw was a statue of a swabby with a white hat, pea coat, bell bottoms, and sea bag (circa. the 50’s). That’s what I looked like in my 4 years in the Navy from ’58 to ’62. I t gave me a nostalgic tug! This is a Lahala tree. 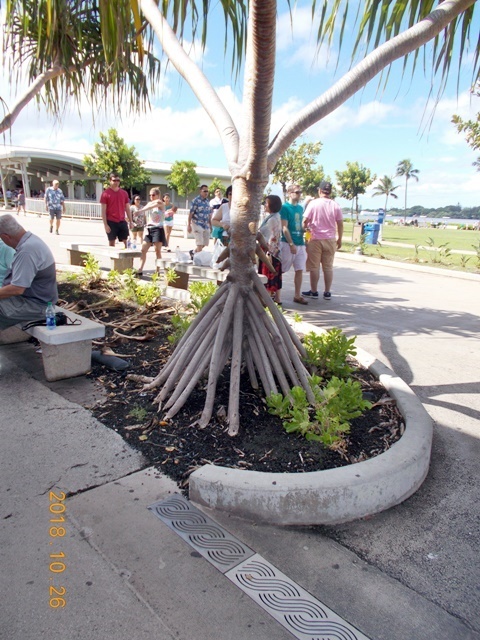 Note the interesting roots. 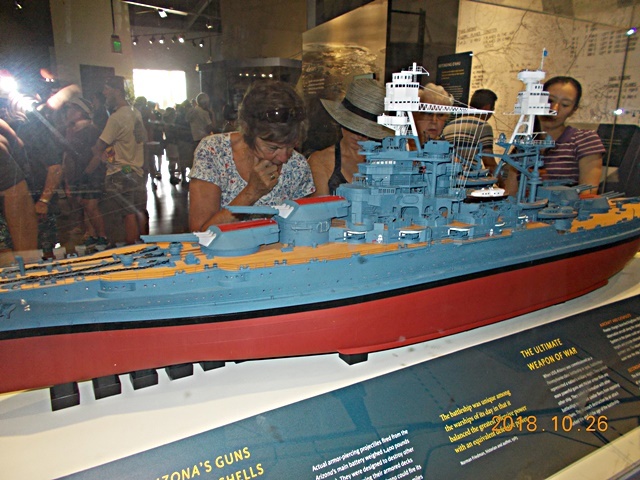 Much of the Pearl Harbor focused on the December 7th, 1941 Japanese attack and the sinking of the Arizona with a loss of 1177 seamen (like the swabby in the statue). In the museum there was this “before” model of the ship. Many other ships, planes, and men we also lost that day! 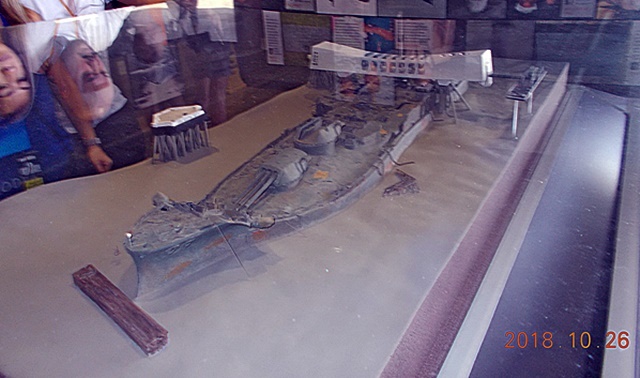 This is a model of the “after” with the memorial pavilion above the sunken wreck. Unfortunately the pavilion was closed to us for needed repairs. We did take a boat tour around the sunken Arizona and the pavilion. The rusted structure in front of the ship’s name is the base of one of the gun turrets still sticking above the water after 77 years. We also passed by the USS Missouri (BB-63). Now part of the Historical fleet. This was where the Japanese signed the surrender documents in Tokyo Bay on September 2nd, 1945 ending the war in the Pacific. 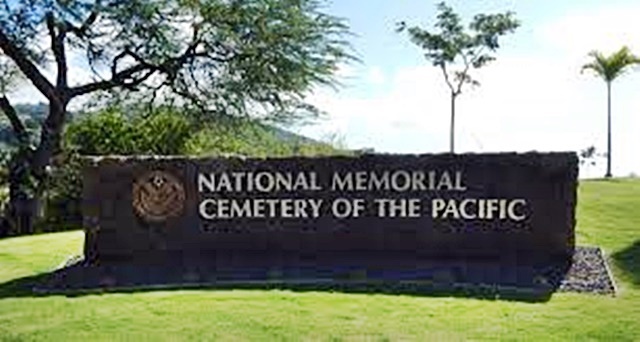 After leaving Pearl Harbor, we went to the Cemetery known as “The Punch Bowl”. This is why it’s called the Punch Bowl. 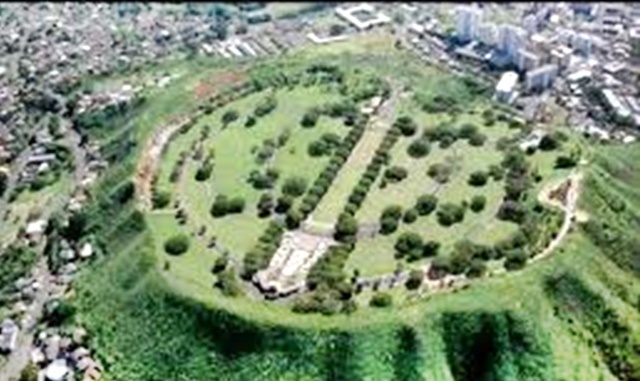 The Cemetery and Memorial are inside an extinct volcano crater. It is currently surrounded by Honolulu suburbs. The cemetery contains over 34,000 graves. 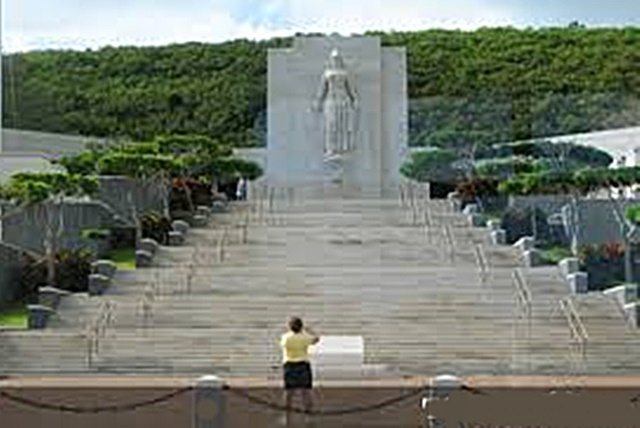 This is the Memorial honoring all the men and women who served in the US Armed Forces and those who gave their lives. This is Lady Columbia aka Lady Liberty or Justice. She represents all grieving mothers. 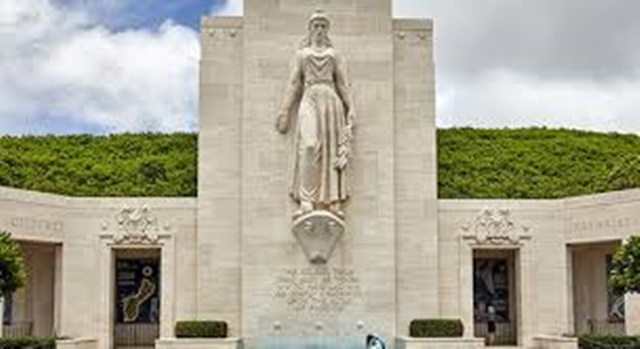 The inscription below it is: “The solemn pride that must be yours, to have laid so costly a sacrifice upon the altar of Freedom” Abraham Lincoln. In 1951 these permanent flat granite markers replaced the original wooden Cross and Star markers. The trees you see are Monkey Pod trees. They have beautiful domed shape crowns that provide a lot of shade as well as excellent woodworking wood. 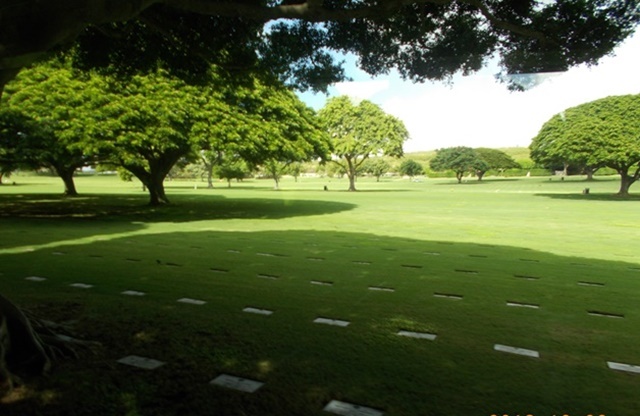 The Cemetery is altogether a truly solemn, beautiful and peaceful place . On our way back to the Hyatt we toured a bit of Chinatown. 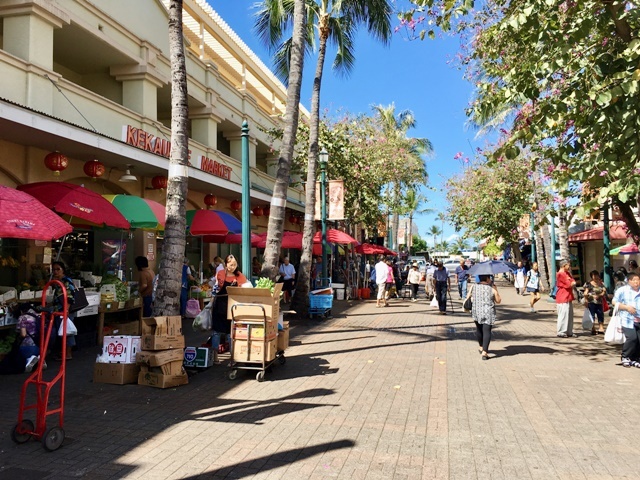 During the 19th century laborers were imported from China to work on sugar plantations in Hawaii. Many became merchants after their contracts expired and moved to this area.Two major fires destroyed many buildings in 1886 and 1900. In 1886, a fire began at a local Chinese restaurant which quickly burned out of control, spreading to buildings nearby. The 1900 fire was deliberately started in an attempt to destroy a building infected with the bubonic plague, which had been confirmed December 12, 1899. After 13 people died, the Board of Health ordered other structures suspected of being infected to be burned. However, the fire also got out of control after winds shifted and most of the Chinatown was destroyed. This is not the Chinese restaurant that started the big 1900 fire. 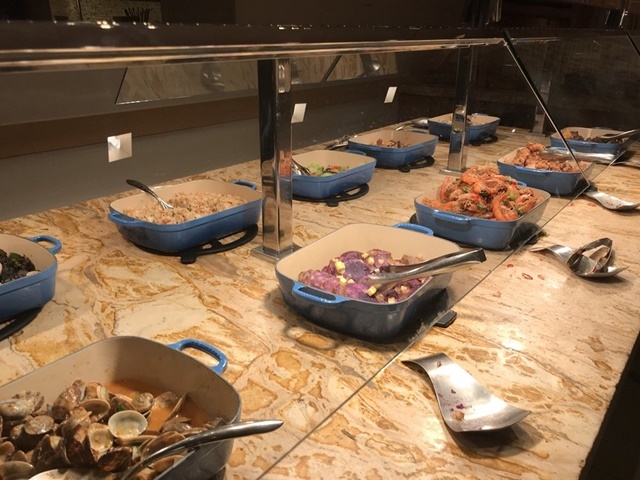 Here are 3 pictures of the Hyatt buffet. 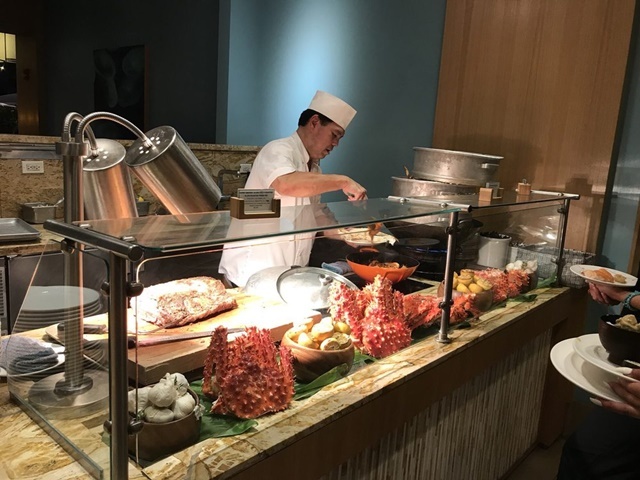 We enjoyed it that evening – complements of the Collett/AAA tour companies. After our tummies were full we hit the hay.